Republicans’ “Jobs Gap” is a misleading measure that means nothing. Here’s one with a much bigger gap. Oh no! 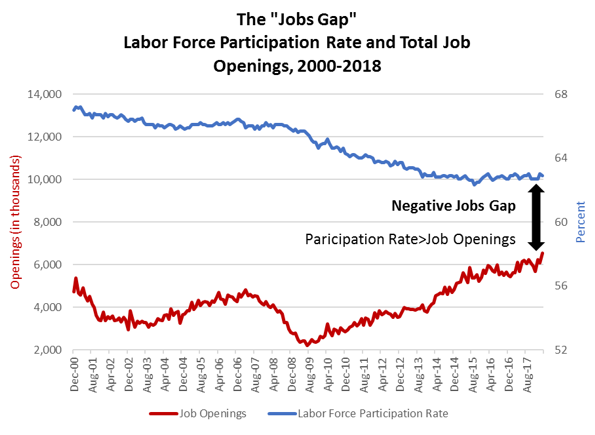 Here’s one with a negative jobs gap (LFPR appears greater than job openings)! Phew! What do the job openings data show? 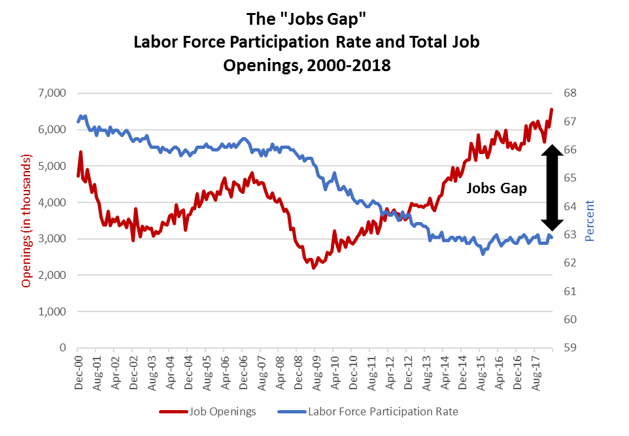 A more serious attempt to learn about the current labor market from the jobs opening data might make use of two figures that the BLS publishes every month when the openings data are released (new data came out this AM). Both show a tightening labor market with people filling available jobs in the way we’d expect at this point in the business cycle. 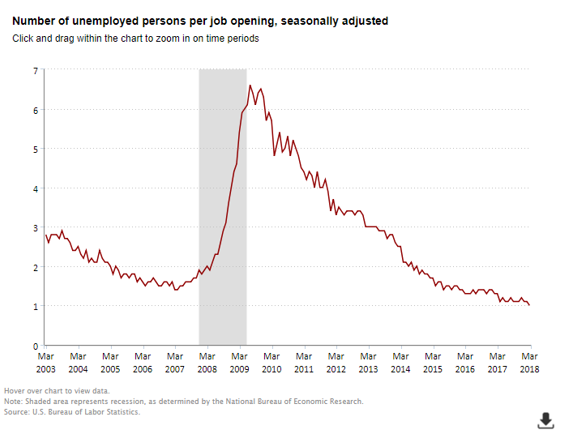 The first figure shows the unemployed per job opening. During the recession, there were almost 7 unemployed persons per job opening. Now, there’s only 1, and the measure is actually a bit below its pre-recession level. The next figure shows job openings and hires as rates (shares of total employment). They’ve both been on the rise as the job market has improved and are at similar levels now. Again, there’s nothing in these data that show people not taking advantage of job opportunities. In fact, for prime-age (25-54) workers, employment rates have been rising at a solid clip. As noted, due to our aging population, the total LFPR can be misleading when evaluating the job market. In fact, the increased share of older persons in the LFPR is one reason for the recent flat trend in the LFPR in the jobs gap figures above, which is why many labor market analysts prefer to look at the prime-age population, age 25-54, as this excludes persons aging out of the labor force. 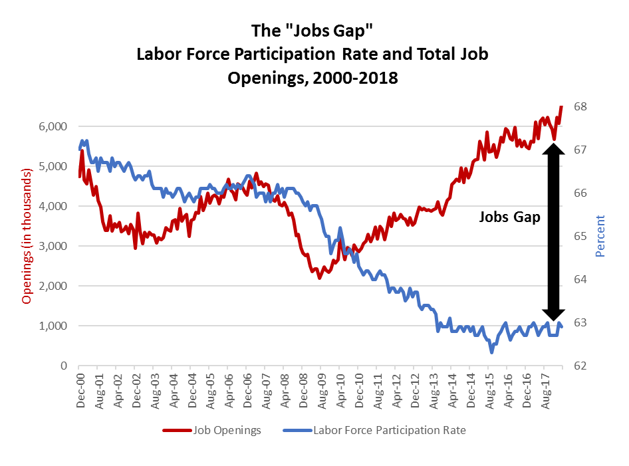 The simplest way to discern if working-age people are taking advantage of job opportunities is simply to look at their employment rates (the share of the working-age population with jobs). The next two figures look at the employment rates for men and women in this 25-54 age range. 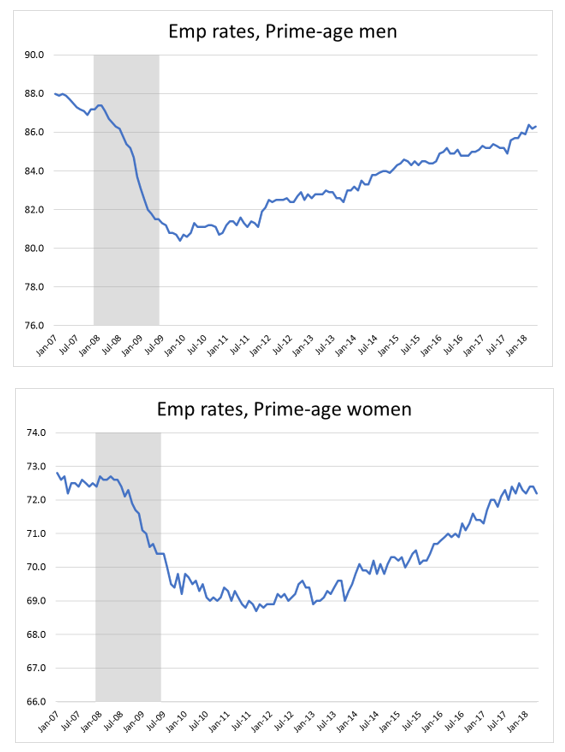 In a trend that clearly contradicts conservative stories about prime-age workers unresponsive to opportunities, both series have climbed steadily in the expansion and both are closing in on their pre-recession peaks. In sum, the labor market is on a long-term, tightening trend, and working-age people are increasingly employed. Unemployment per job opening is low, hires and openings rates are up, and employment rates for prime-age workers are steadily climbing back to pre-recession levels. Are there any downsides to the current job market? One significant shortcoming in the current labor market is that national wage growth has disappointed, especially for middle-wage workers, both in nominal and real terms. As I show in this recent analysis, wages have typically grown faster at current levels of unemployment, and in real terms, middle-class worker pay is not up at all since 2016. It is also the case that even at low unemployment, regional pockets of above-average joblessness still exist. Recent research published by the Brookings Institution, for example, shows that potential workers in some places remain unreached by low unemployment, emphasizing, for example, the gaps between employment rates for prime-aged workers in the hot coastal markets versus places hurt by manufacturing job losses. Moreover, as is far too often the case, minority jobless rates remain well above those of whites, even controlling for education. Congress could therefore do more to address the structural barriers that even at low unemployment stand between too many Americans and the job market. These barriers occur on both the demand side (too few job opportunities) and the supply side (skill or health deficits, discrimination, criminal records) of the labor market. Workers whose skills don’t align with today’s employers’ demands will need robust training and apprenticeship programs. Others will require work supports including higher minimum wages, housing and nutritional support, and, in some places, direct job creation programs. Two new papers from CBPP provide excellent guidance in terms of what sort of interventions have been found to be most effective in helping left-behind workers overcome this spate of labor market barriers. It should be noted that because they fail to address these structural barriers, adding work requirements to anti-poverty programs will backfire. And yet, instead of investing in jobs, training, and work supports, the Congressional majority passed a regressive, deficit-financed tax cut that adds almost $2 trillion to the 10-year budget deficit. If we truly hope to help workers left behind, these resources are sorely misdirected. Note: All data are from the BLS. Thanks to Somin Park for lots of great help. Share the post "Republicans’ “Jobs Gap” is a misleading measure that means nothing." 4 comments in reply to "Republicans’ “Jobs Gap” is a misleading measure that means nothing." Anyone with a clue, ok that’s hardly anyone, knows that you can only subtract numbers with the same units (pro tip: checking the units will find many mistakes). What if you convert the job openings to a percentage of the total jobs? Then at least you have percentage on both scales. Does this make it even more nonsensical? There are things that few economists seem to consider. Why are there pockets of higher than average unemployment? Job hunting is not costless. Job hunts can be geographically limited by lack of available transportation. The idea that you can easily relocate to a place where there are available jobs is unrealistic. Even finding out where those jobs are is almost impossible. There probably is information available, but most people who are likely to become jobless don’t know about it. If you’re in the top 10% you have a network, friends who will help you out, maybe even hire you temporarily (hi, Megan McCardle). Even middle class people usually don’t have those kinds of connections. I understand there are economists who actually study such things, but I don’t believe I have ever seen anything published by them, certainly not in the last ten years. Can you, perhaps, discuss some of their findings in a future column and recommend some accessible information? It seems when a group with special interest posts data to support a claim they make, they have no problem omitting or completely disregarding the part of the picture that leaves in grey the matter they wish to present as black and white. Similarly to Republicans ignoring that LFPR includes high school, college and retirement aged folks, it seems you have choosen to omit that large businesses are saving at the lowest rate since before the ’07 recession(1). This show of good faith in the economic direction we are having will directly influence corporation’s decisions to hire within ou borders. Since the Tax reform, the companies Apple and FiatChrysler have promised to bring 23,000 jobs on to US soil alone(2). Perhaps its not only those on the right who turn a blind eye when convenient, Mr. Bernstein. We cannot let the US labor market become a throw away market. We can’t just throw away good workers because they make mistakes. Well, we can do it for a while but this is where economists become useless in their analysis: when does the inhumane treatement create a total breakdown in other areas like politics?